• Lara’s utility light will turn on/off automatically when necessary. • Pressing the X button and then quickly pressing the O button causes Lara to perform a swan-dive. • Pressing the X button while Lara is rolling (non-combat) causes her to perform a somersault. • When Lara swims underwater without Diving Gear, she uses up air and her Breath Meter decreases. If the meter empties completely, this directly affects her Health level; she must surface for air or risk drowning. Lara will find objects that she can pick up and carry in her hand or arms throughout her adventures. These can be used in a variety of ways. When Lara is close enough, she can pick up objects by pressing the △ button. • Press the O button to place the object on the floor. • Press the R2 button to throw the object. Lara can perform an athletic chimney jump when two suitable opposing walls are close enough for her to jump from one to the other. • Jump toward a wall by pressing the X button. • When Lara connects with the wall, quickly press the X button. Lara will jump back off the wall. • Press the X button repeatedly to have Lara bounce upward between the walls. NOTE: A single jump off a nearby wall can allow Lara to grab onto ledges or poles she wouldn’t be able to reach directly. Lara can use her grapple in a number of different ways: to attach to moveable objects and drag them toward her, to swing across gaps, and to climb up and down. Once attached to a grapple point, Lara can either pull on the point that the grapple is attached to, or bend the grapple line around objects and then pull on the object around which the grapple line is bent. • Stand facing a suitable ring and press the □ button to connect the grapple line. • Press the △ button after connecting to pull the grapple line. • Press the O button to detach and retract the grapple line. The grapple can also be used to allow Lara to climb up or down walls and cliffs. • To rappel down, move Lara off the platform she’s on by walking or jumping her over the edge. • To climb up, position Lara under the grapple point and press the X button to hang from the grapple line. 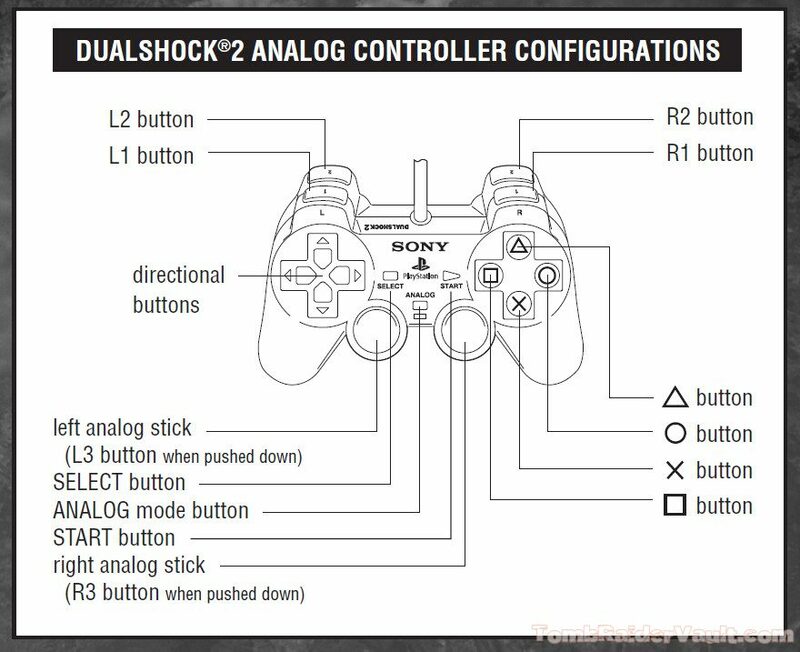 • Hold the △ button and move the left analog stick to move Lara up / down. Lara can use the grapple on a wall-mounted ring to run along the wall itself. • Attach the grapple as usual, and then swing her left/right with the left analog stick. • To jump away from the wall, move the left analog stick in the direction you want to jump, and press the X button. When Lara is faced with two or more enemies, press the R1 button and move the left analog stick to have her fire upon two enemies (when it is possible for Lara to do so). Sudden, dangerous situations automatically trigger Lara’s Adrenaline. In this mode, time slows down and Lara’s responses are heightened. • When Adrenaline is activated, use the standard controls to avoid danger. Lara’s health will automatically regenerate after she has taken damage from falling or during combat. • Press the SELECT button to activate Lara’s PDA. • Press the X button to see what to focus on (hint). • Press the R1 button to see what to do (task). Lara can use a powerful high-performance motorcycle that can be adapted for use across different terrains. • Press the △ button to mount or dismount the vehicle. • Use the left analog stick to steer. • Press the L1 button to accelerate. • Press the R2 or L2 button to brake. • Press the L2 button to reverse. 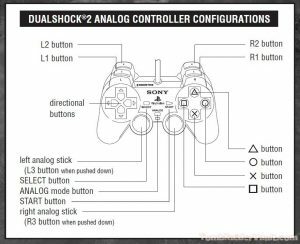 • Press the R2 button and use the left analog stick to perform a Quick Turn. • Press the R1 button to fire the weapon mounted on the motorbike. • Hold the R2 button to brake. • Press the L1 button to rev the engine. • Release the R2 button. • To perform a stationary quick-turn, repeat the steps and steer hard left or right. Activate Lara’s PDA by pressing the SELECT button. Area Info reports the number of Treasures you have found in the area you are currently exploring. View information on the items in Lara’s inventory, including essential equipment, weapons, and key objects currently in her backpack. If you need help, access FIELD ASSISTANCE, where you can get a hint or a more explicit task that will help you progress. Complete the adventure to unlock this option and allow Lara to collect any important items she might have missed on her first visit. There are various Treasures in TOMB RAIDER: UNDERWORLD to be discovered and collected. • You can revisit a location you have previously visited to search it for any uncollected Treasures. To do this, use the REVISIT LOCATION option in Lara’s PDA. Every level in the game has a number of checkpoints to pass. When Lara passes a checkpoint, the word CHECKPOINT appears on-screen. • Press the START button to open the Pause Menu. • Highlight a slot to save into (or overwrite), and press the X button. IMPORTANT: There is no automatic save when you leave the game. However, if Lara loses all health and dies, she will automatically restart at the last checkpoint passed, regardless of whether you have saved the game at that point. If you quit a game without saving, you will lose all progress made since the last saved checkpoint. If you have a game in progress and data saved, the START GAME option in the Main Menu will be replaced by RESUME GAME. • Select RESUME GAME to resume your latest save or LOAD GAME to choose a separate save. Note that the save file most recently made becomes your current save and will be selected when you choose to RESUME GAME, even if this does not represent the furthest progress you’ve made in the game. You can also load any game from within the Pause Menu by choosing a save slot (save details appear on-screen for each save slot).